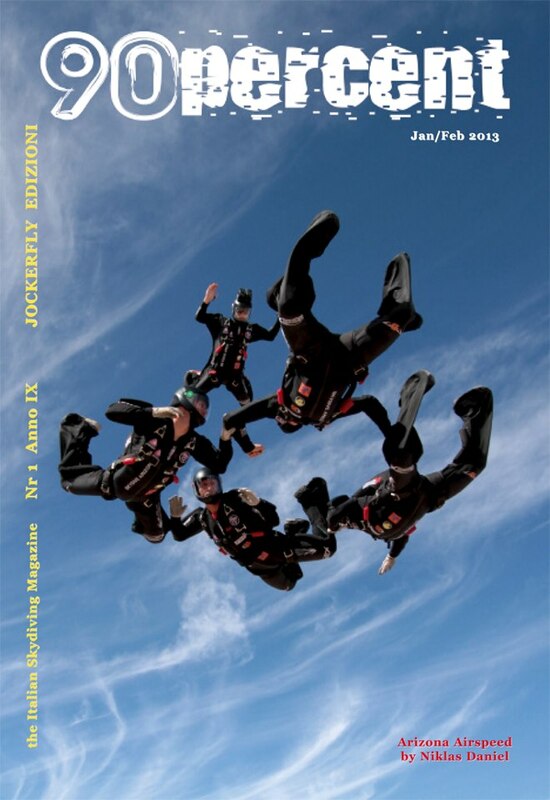 I would like to thank 90Percent (Italian Skydiving Magazine) for utilizing one of my Arizona Airspeed photographs for the January 2013 cover spot. The photo depicts the U.S. Arizona Airspeed 4-way formation skydiving team’s videographer, Bill Schmitz, filming Thomas Hughes, Josh Hall, Niklas Hemlin and Mark Kirkby as they fly their way to become the 2012 USPA National Skydiving Champions. Please click here to view the PDF version of the Magazine. This entry was posted in 2012 USPA National Championships, 4-way, 90Percent (Italy), Arizona Airspeed, Competitions, Cover / Featured Photo, Events, Formation Skydiving, Performance Designs, Photography, Publications, Skydive Arizona, Skydiving, Sun Path, USPA by niklasdaniel. Bookmark the permalink.